I have been to over a hundred attractions in my years of traveling. Almost half of those attractions were strictly indoors. Honestly speaking, I have never had more fun in an indoor attraction than I did at Bane Haunted House. It is without a doubt one of the best attractions I have ever seen. Now in its sixth season and third at their current location, Jennifer and John Condron of Bulletproof Haunts have built an amazing attraction that can compete with juggernauts of the industry. Take it from Jennifer herself in a 2011 Neighborhood Journal interview: “I was born to do this, born to do it, born on mischief night. I love it I live for it I thrive for it. Gore blood … that’s what I am”. Jennifer and John do not believe in the overuse of animatronics, so you will not see any of them inside. They believe in the power of great acting and direction and timing. The actors all knew what they were and where to be and NEVER dropped character. Touching isn’t for everyone and I am confident that the actors who are allowed to touch know who to touch and how to touch. In my case, they treated me like a dirty rag doll and it was awesome. Since I make it a goal to see as many haunts as possible each season, I sometimes end up going solo and, yes, it’s always awkward. I end up asking a group if they wouldn’t mind me tagging along… mainly because most actors are not expecting or trained to deal with just one big guy not screaming his head off. When it was my turn to go in, I asked the ticket taker if I could tag along with another group. Without hesitation, she told me, “I recommend going alone,” and that’s when I knew I was in for a wild night. Sometimes actors will look past me to see who else is coming; this never happened. The attention was completely focused on me and only me. I know what you are thinking; they knew a reviewer was coming through so they treated me special. The truth is, I was supposed to come the night before. I hopped in line without talking to anybody. They had no idea if I was coming. This is just the same magical treatment you will get no matter what. In 2011, Bane reported having an acting crew of about 35 a night. Today, they employ about 100 and have 85 actors a night. Bane has one of the best casts I have ever seen! Throughout the entire attraction, every actor was dressed for their part. Except maybe one, but they were in a Bane t-shirt so it’s all good. Although it was very dark in most parts of the haunt, I believe almost every actor had at least some form of gory make-up. The story involves a girl who turns into a raging cannibal after getting bit by a rabbit that was used as a test subject. Whether or not you could officially call the actors zombies, I don’t know, but they did all have damage to their face in some form or another. The most memorable costumes were the altar boy children covered in blood. Nuns and a nasty minister character force you to wait in a hellish church room. The boys are roaming everywhere in there and creepy as Hell. Starting at the very beginning I just need to make the announcement: Bane Haunted House is located on route 10 or W. Mount Pleasant Avenue. If you’re traveling East on Rt. 10 toward New York City, you need to turn right onto Mt. Pleasant Ave. about a mile and a quarter before Bane. About a mile down the road you can turn left onto Okner Parkway and cross over Rt. 10. Otherwise, you will have to keep driving down Rt. 10 until you can turn around and it is not fun. Technically, Bane is located in the back of the large building that runs parallel to Okner Parkway. You will see plenty of parking signs; just don’t let your GPS ruin your evening. There is a massive parking lot with plenty of free parking. 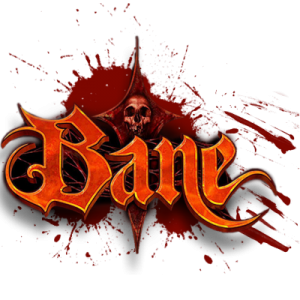 Maybe, at first, you will feel a bit uncomfortable walking into Bane, given the fact that there are security personnel all over the grounds and a giant list of rules to read while you wait in line; upon entering the warehouse you will be scanned for weapons. Bulletproof Haunts also runs a tactical force training program for police so they spare no expense making sure their customers are safe. Medical staff is always on standby in multiple locations, from the parking lot to the back of the attraction. Just like all the other blood and guts lovers, Jennifer and John are some of the nicest people you will ever meet. I showed up at 3pm on a Friday and just happened to bump into John putting the final touches on a rusty door. Afraid I would be standing in a long ticket line I thought maybe I could buy a ticket early. They were more than accommodating and I got a free shirt as one of the first 100 customers of the night! There is a snack booth with drinks and candy and chips and all that good stuff. If you are standing in line, though, you better make sure you get your snacks first. You will walk directly into the booth when you exit the attraction, but there is no easy way of getting out of line to get some refreshments. Unlike most places with a simple rope to divide the lines, Bane has heavy-duty, wooden fencing that’s impossible to go under and difficult to climb over, so don’t even try it… and don’t be a dope showing up with sandals or heels; you will be told to change into sneakers or boots before entering the building. Trust me this isn’t a tiny smooth walk through. Between the big banner sign on Rt. 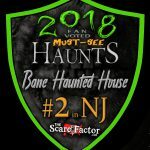 10, the illuminated sign on the front of the building, the box truck, the parking signs, and the big banner draped over the back of the warehouse, you’ll know you are at a haunted house before turning off the road. Outside, there isn’t much to talk about as security is doing a particularly good job just making sure everyone is safe. Once inside, the overwhelming sense of a haunted attraction kicks you in the face. There is no music inside; it’s more of an ambience of horror noises… both natural and through the speakers. 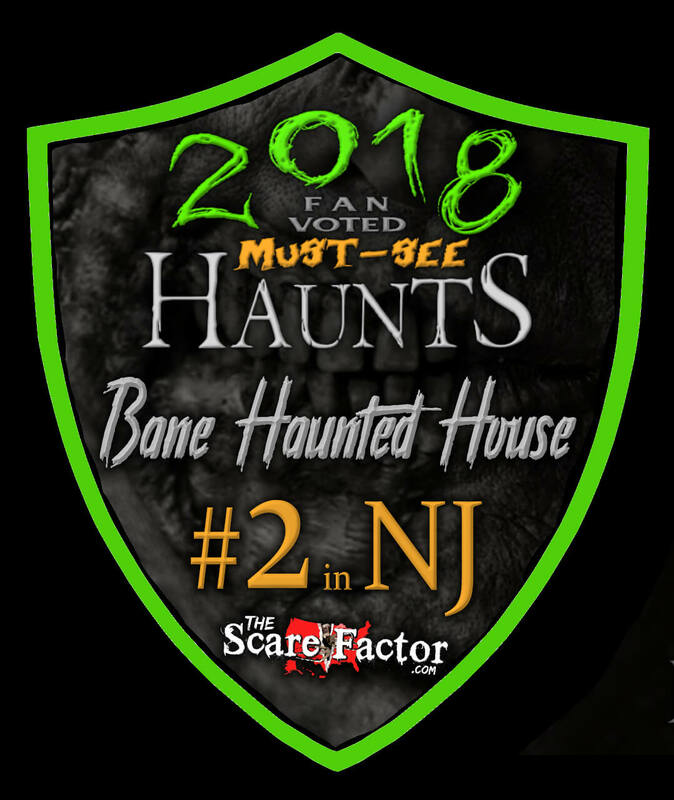 Bane is said to be the longest haunted attraction in New Jersey. Being the longest means a lot of space to cover and they cover it well. Sure, this is a haunted house and a haunted house can always use more stuff and things, but it’s dirty and rusty and junky everywhere in there. Sometimes, the noises of the rest of the haunt can be distracting and even annoying at times in most attractions. This is not the case with Bane. After the first time you experience being grabbed and dragged around, you fully understand that those far away screams can only mean there is more grabbing and dragging in store for you. In a weird way I could say you become the special effects of Bane. Watching your fellow attendees get shoved into a morgue locker and knowing you are next is quite a sight. I counted a total of five or six times you are forced to get into something you do not want to get into… or at least were not expecting to. I do not remember seeing any animatronics and it seems to be something Jennifer and John are very proud of. They strive to bring out the best in their actors and rely on the training they give them. You will experience a vortex tunnel and some moving walls. And a claustrophobic tunnel that I could just barely push through. In fact, a girl in front of me couldn’t even budge through it, so I had to step in and act like some NFL linebacker. Bane is the perfect showcase for how to use quality acting and creative setups to achieve a great haunted house experience without the overuse of animatronics. The story of Bane Haunted House is about a little girl who started playing with a test subject bunny. The bunny bites the girl and the girl slowly starts to develop a taste for blood. Soon, all of the test subjects are eaten alive and the girl continues her bloody rampage on her family. I’m led to believe that, because of whatever this virus is, we are left with a bunch of crazies inside this house. For most of the attraction, you are in a haunted house. At one point, you are in sort of a circus-themed room, but it could just be a polka-dot room with a flickering light and a guy in a creeper, generic clown mask. The house is exited before going into a cemetery around a swamp and, ultimately, into an evil church. I loved the setup everywhere but I am left confused as to whether or not some story is happening. It had been eleven months since I’ve gone through a haunted attraction. The chaos of indoor attractions sparked my memory quickly the night before I went to Bane Haunted House. The constant loud noises bouncing back and forth from cement wall to iron beam makes for a very annoying night sometimes. Outdoor haunted attractions tend to have an unfair advantage when it comes to the haunted experience. Just being outside to breath in the cool crisp fall air could be an attraction in itself. On my way to Bane, I was reminiscing in these thoughts and, for a brief moment, I considered maybe cutting back on the indoor attractions going forward. Well, the amazing crew at Bane Haunted House must have ESP because all I can think about now is GOING BACK! I was shoved into so many different boxes and spun around and shoved back and forth I couldn’t remember my name when they threw me out of the last door. I practically fell to the concrete floor in front of the waiting line for everyone to see. They only let two or three people in at a time to give you the best experience possible. There is no way they are letting a big group of friends or strangers to march in and ruin the timing and effect of everything they worked so hard for. At multiple times during the attraction, you will either be asked to sit somewhere or remain in whatever they locked you in. This is the most genius way to control the crowd I have ever witnessed. Frightening moments are achieved through personalization. If an actor gets to worry about three or two, or one, then those people will get the best attention they can ask for. Bane’s general admission ticket is $27 after taxes. I was put through a good twenty minutes of non-stop horrors. Speed pass tickets are $40. Military personnel are always free to experience the haunt. College nights on Thursdays are $3 off with college ID. Animal Food Drive Wednesdays receive $3 off with a donated can of dog or cat food for the animal shelter. Family-friendly “Happily haunted” every Sunday from 3pm to 5pm is $8 for children 12 years or younger to experience the haunt with a flashlight and no monsters. Group rates for 15 people or more. Oh, and don’t forget about Groupon discounts. The type of entertainment that I received inside Bane is well worth the ticket price. If I could have, I would have gone right back to the ticket booth and bought myself another ticket. There are only two things in the world that would stop me from returning for a second go around: 1- It wasn’t good enough, 2- There’s another haunted attraction I’ve never been to right up the road closing soon. Most nights #2 is in effect. It isn’t even October of 2016 yet and I already have my first return destination on the list for 2017. BANE! I’M COMING BACK!! !